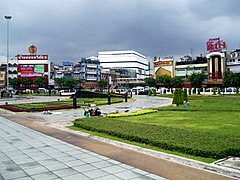 The King Taksin Monument is in the center of Wong Wian Yai, a huge traffic island in the center of a busy junction. 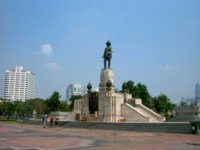 Symbolic of his prowess in battle, the monument depicts King Taksin the Great astride his charger with sabre raised to signal a cavalry charge. It was Corrado Feroci again who was called upon to undertake the task of designing the King Taksin Monument. The monument is dedicated to the one and only king with the capital in Thonburi across the Chao Phraya from Bangkok. King Taksin who raised Thailand from the ashes of Ayutthaya and unified the rival kingdoms. When Ayutthaya was destroyed in 1767, Thailand was left without a king and a capital, a kingdom divided and leaderless. Rival kingdoms, which had contributed to the collapse and destruction of Ayutthaya, scrambled for power, resulting in anarchy. 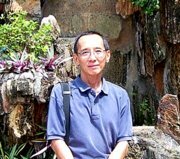 It was left to Sin, the son of a Chinese father and Thai mother, to rise to the occasion and assume leadership. Governor of Tak province, with the title Phraya Tak, he adopted the name Phraya Taksin. An able general, a master tactician and strategist, he shrewdly withdrew his troops from Ayuttaya and consolidated his power in Chantaburi. 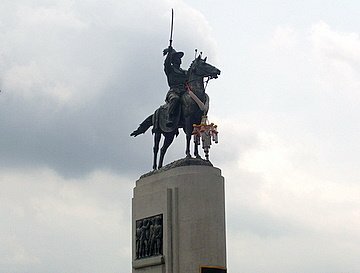 In 1767 he established his base in Thonburi, further away from Burma and the rival centers of power to the north. It was also closer to the sea and his sources of supply from the Chinese merchants in the area. Within the same year, he drove the remaining Burmese garrison from Thai soil. 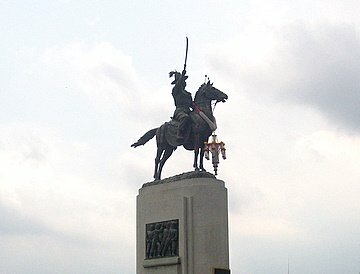 In 1768 King Taksin ascended the throne with Thonburi as the capital, where the King Taksin Monument is currently located. By 1770, he brought the rival kingdoms in Phimai, Fang, Phisanulok and Nakhon Si Thammarat to heel. After unification, King Taksin set out to secure the northern and southern regions of Thailand, traditional Burmese invasion routes. In 1769 the southern provinces were brought under Thai suzerainty. In a prolonged campaign, the Burmese were driven out of northern Thailand and in 1776 Lanna was restored to Thai rule. In his final campaign in 1778, Cambodia and Laos were invaded to secure the eastern borders and preempt Burmese intervention. By 1779, the borders of Thailand were secure. King Taksin's achievements were however overshadowed by his ignominious fall from grace. Later in his reign, he suffered from illusions of power, considered himself a deity with supernatural powers and flogged those who did not acknowledge him as such. His generals, convinced that he had gone mad, revolted and removed him. In 1782, the ablest general in the field was recalled and made king. Chao Phraya Chakri or King Rama I ascended the throne to start the Chakri dynasty that has reigned over Thailand ever since. King Taksin was executed according to royal custom, bounded in a velvet sack and clubbed to death with sandalwood. Owing to his disgraceful end, he was not well remembered. It was only in 1954, after 172 years, that the King Taksin Monument was built to honour his earlier accomplishments. Whatever his shortcomings later in his reign, his unification of Thailand provided the foundation for the future. The monument to King Taksin is in recognition of that contribution by a great warrior. The King Taksin Monument is at the center of the traffic roundabout called Wong Wian Yai. 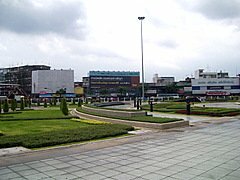 Wong Wian Yai, literally the big roundabout, is at the junction of Somdet Phra Chao Taksin Road and Prachathipok Road. Take a skytrain to S8 Wong Wian Yai station. The monument is about a km away. If you are not up to walking take a tuk tuk or taxi. For other monuments by Corrado Feroci.